On Sunday, May 18th, the women of Barnard's Class of 2014 graduated. This interactive narrative tells the story of the day's events, including the ceremony, which took place at Radio City Music Hall. For best viewing open to full screen. Just press the play button in the lower left. Or to explore on your own, click the bottom center arrows to move forward and back within the story. Double click to skip to the next section, or click and drag to explore the different elements of the story. Watch Cecile Richards' commencement address, view the full ceremony, check out photos from the day, or see #Barnard2014 social media. 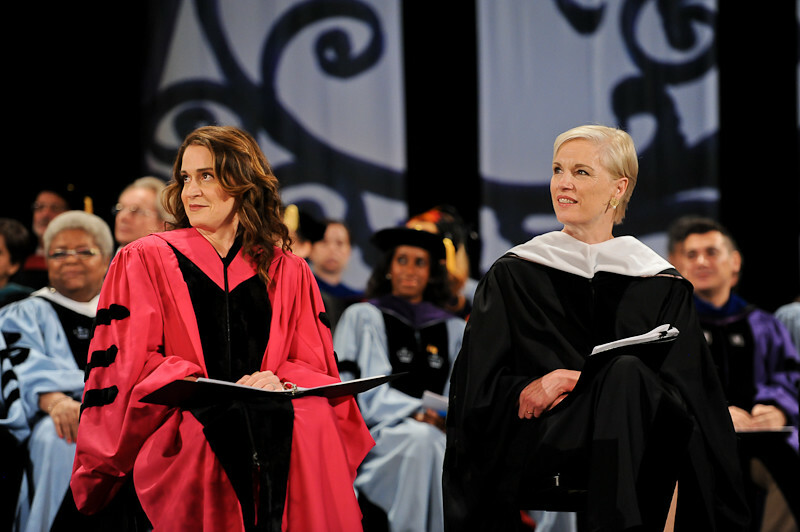 Cecile Richards, president of the Planned Parenthood Federation of America and the Planned Parenthood Action Fund, delivered the keynote address at Barnard College’s 122nd Commencement on Sunday, May 18, 2014 at Radio City Music Hall. Richards spoke before an audience of about 6,000, including Barnard’s 570 graduates along with faculty, trustees, family, and friends. "Life as an activist, troublemaker, agitator, is a tremendous option and one I highly recommend," said Richards. "The world we live in can be tough. It can be unjust. But here's the great news: Each of you has the power to do something about it. You get to build the world you want to live in." Richards also received the Barnard Medal of Distinction, the College’s highest honor, together with three other honorees: Mahzarin Banaji, social psychologist and professor of social ethics at Harvard University; Ursula Burns, chairman and chief executive officer of Xerox; and Patti Smith, acclaimed musician, poet and artist. The Medals of Distinction were presented by Barnard President Debora L. Spar, who also presided over the ceremony. An added highlight of this year’s ceremony was a special performance by Patti Smith, who sang "In My Blakean Year." Additional speakers included Jolyne Caruso-FitzGerald ’81, chair of Barnard’s Board of Trustees and CEO of the Alberleen Group, and Provost Linda Bell, who spoke on behalf of the faculty. Senior Class President Stephanie Fernandez ’14 and Student Government Association President Madelyn Popkin ’14 delivered speeches to their class. Rachel Salomon ’14 delivered the Academic Reflections, and Senior Fund co-chairs Jennelle Fong ’14 and Malvina Kefalas ’14 announced the senior class gift of refurbishing the iconic campus statue, "The Spirit of the Greek Games."